Home  My Gleanings Page  Illustrated Edition - Page 2. Illustrated Edition - Page 2. Mr. F. G. Hoagland rendered valuable assistance in getting up this paper. He makes the work a specialty and after trying him the PRESS cheerfully recommends him to the brethren of the press. An error occured in dating part one and two of this paper. It was expected that this issue would be published on the 9th, but the non arrival of a portion of the paper necessitated a postponement until the 16th. Dr. W. J. Deboe retires from the control of the schools of the county, after four years service, with the consciousness of having made a worthy officer. He has been impartial, and untiring in the important work, and faithful to the trust. By a vote of 182 to 105, thirteen Democrats voting with the Republicans, the House on Monday adopted the tariff bill, as amended by the Senate. Immediately after the passage of this measure the House passed separate bills placing sugar, coal, iron and barbed wire on the free list. A community is, in a large measure, judged by its people; hence we present the faces and a short sketch of many Crittenden county citizens. Throughout the county we have hundreds of [o]thers just as honorable, useful, prosperous and handsome. We are proud of the samples, and guarantee that the entire crop will average up with them. It is announced that Gov. Brown has appointed Hon. 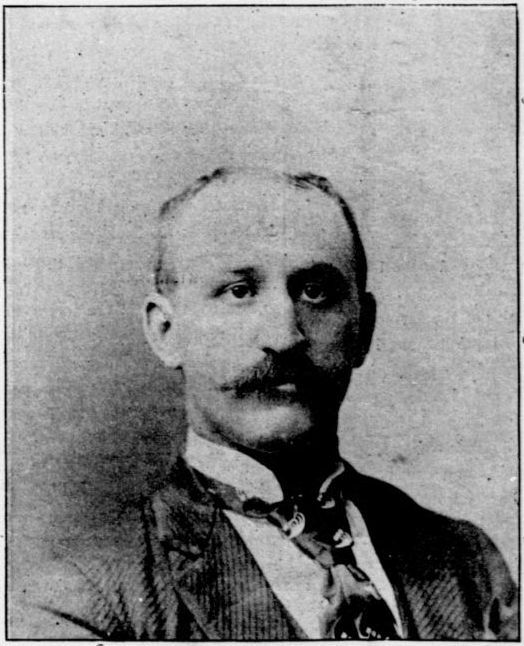 I. H. Quigley, of Paducah, to fill the vacancy of the appellate bench occasioned by the death of Judge Bennett. 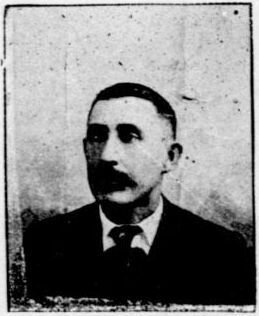 Mr. Quigley is one of the rising young men of Western Kentucky and ordinarily his promotion to a place of honor would meet the plaudits of the people, but this appointment will be regarded by many as a mistake on the part of the governor. those who wear the ermine of the highest court in the land, should not only be versed in the law, but burnished by a long and vaaried experience at the bar. They should be sages indeed and in truth. We have mentioned every article in the county except her politics, and to briefly describe this somewhat luxuriant product it is only necessary to call to mind the expression of the Lexington Judge. this year we have a Democratic ticket composed of honorable gentlemen, every one of whom has not always been a Democrat; we have a Republican tickes of honorable gentlemen, every on of whom has not always got salt at the Republican lick log; we have a Third party ticket, of splendid men, all of whom have at some time in their career been other than Third party men; we have a Prohibition ticket of splendid citizens, all of whom, we are credibly informed, were at one time Democrats. Now if there is anywhere on the habitable globe a single man (or married one, either,) who can not find congenial company somewhere in this heterogenious mass, he can go in with the colored brother, who has intimated that he is going to stay at home this year. At the primary two years ago only 11804 votes were cast, while at this primary 13953 were polled--2149 more than before. Stone rerceived 200 votes less this time than before, while Hendrick received 3431 more. tillery, two saddle and harness makers, one carpenter shop, one dairyman. For years one of the chief features of Marion has been her school. Marion Academy was organized in the sixties, and no institution of the kind can show a better record. Successful men in all the honorable callings of life have gone out from her walls, and events have proven that they were well armed and equipped for the battle of life. Lawyers, doctors, ministers, teachers, merchants and railroad men, who have taken commanding positions were tutored at Marion's well known and highly prized school. Last year it was decided that the four room building was too small for the growing town and provisions were promptly made for an $8,000 building. The house is now under construction and we present a good view of the front of the building. It is a two-story brick, four large rooms, besides the halls and cloak rooms on the first floor. On the second floor, which is reached by two broad flights of stairs, are tow school rooms, the Superintendent's office, and the assembly hall. The house will be supplied with modern school furniture, and all the necessary apparatus used in the school room. A corps of five splendid teachers has been employed, and the new school will be organized under the graded system, and the course of study will embrace in addition to the common school branches, a high school or academy course. The school will be free so far as tuition is concerned, to all the children in the district. The people of Marion are more than ever interested in this institution, and it is going to be one of the best schools in this end of the state. It has often been remarked, and truthfully too, that the people of Marion are a church going people. The substantial character of the church buildings, as indicated by our illustrations, is an evidence that the people are interested in christianity of the active kind. The Methodist church was organized in the seventies and has had a steady growth ever since. A large brick structure was build soon after the organization but ow[illegible] the architecture, [illegible] down, but soon the handsome building shown in the illustration appeared. Many big revivals have ben held in this church, and it has been a great power for good in the community. A Sunday school numbering nearly 200 teachers, officers and pupils, has been running for years. Rev. J. V. Guthrie is the present pastor. The Presbyterians have a handsome structure and a growing congregation, a fine Sunday school, an attractive choir, and above all, a devout membership. 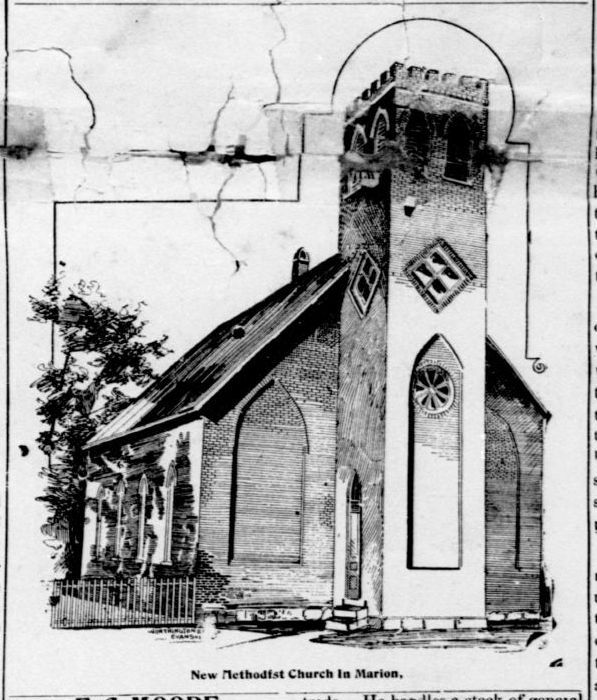 A short sketch of the organization of this church is given under the pastor's portrait. The Baptist congregation is under the pastoral care of Eld. 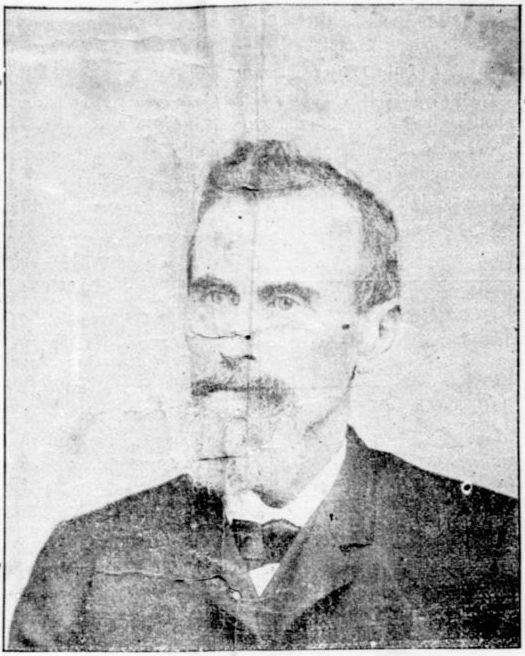 T. C. Carter, one of the most earnest and successful ministers of the county. This church has a live membership and of course is annually increasing in members. It has a prosperous Sunday school, well attended prayer meeting, and is doing a good work in the community. The building is a model of neatness and convenience. The Cumberland Presbyterian church, only a few years organized, has doubled its membership within the past two years. The pastor is Rev. Mr. Price, and under his care no church ever grows lukewarm. When the building was put up, the congregation was small, now the rapid growth, both in numbers and in devotion to the cause has set the congregation to looking forward to the time in the near future when a more commodious house of worship shall take the place of the present modest but cozy house. With its Sunday school and prayer meetings this church is doing its part for the spiritual well being of Marion. The Christians of Campbellites have an organization but no church building, and no regular preaching. An effort has been made to secure a house, and doubtless at no distant day it will come, and add to the good reputation of our community. This feature of the town will always be found a safe and reliable standard from which to judge the propensities of the men who constitute the business element of the town and surrounding country. Banded together by solemn and irrevocable ties, for the purpose of friendship, morality, brotherly love, sympathy, counsel and support, wherever they are found strong in numbers will always be found a harmonious and united community. Silent often in their charities, the outside world can never know to what extent it is indebted to those noble organizations. Although doubted by some, their doubts and suspicions are the offspring of ignorance of the motives and workings of these institutions. Any community in which these praiseworthy organizations exist can always be trusted as peaceful and law abiding, and a goodly land in which to dwell. In Marion are four of these soci[e]ties, and each has a strong membership. Bigham Lodge F. A. & A. M. is the oldest and strongest. It has a membership of seventy and is one of the best working lodges in this seciton. It owns its own hall and the lodge room is well appointed. Within the last two years it has grown rapidly. Blackwell Lodge Knights of Pythias, was organized seven years ago, and has a membership of over fifty. It has just completed paying for its hall, a picture of which is in this paper. From the start this institution grew rapidly, and it now embraces in its membership many of our best men, expecially among the young. The lodge room is elegantly furnished and is one of the most attractive in the county. The membership is not confined to Marion, but young men from various parts of the county have united with it and it is now one of the fixed institutions of this place. The Ancient Order of United Workmen has a membership of forty, and is growing. Its members take a great interest in lodge meetings and are devoted to the order, which is very popular in the town and country. The Knights of Honor have had a lodge here since 1879, and its members embrace some of the oldest and most substantial citizens. The society at Marion is as good as it is anywhere. The people are unostentatious, friendly and social. We have no aristocracy. 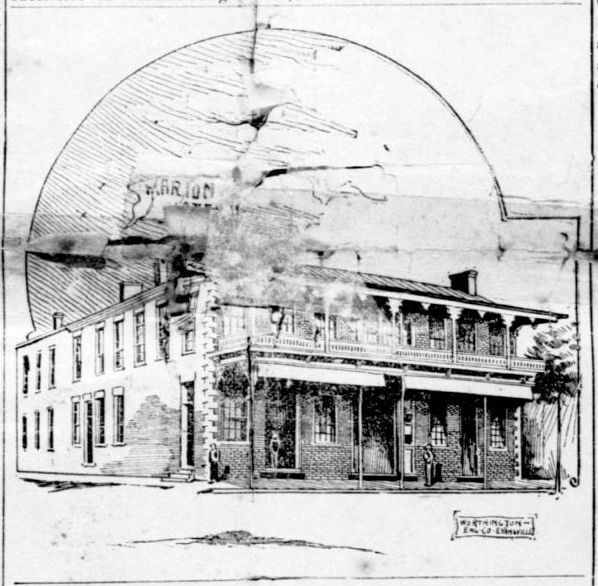 For the purpose of hearing the leading men of the country and bringing the best talent to Marion, forty of the young men of the town have organized a Lecture Club and through the influence of this club the people of Marion are enjoying a distinction no[t] often accorded to a town of this size. Taking the healthfulness of the location, the good morals of the community, the friendly disposition of the people, the cheapness of living, and the advantage of our school all into consideration, there is no better place than Marion to send your children to school. And there is no better place to live than Marion. The last seven years has seen the town double its population; and the growth has not been of a mushroom nature either, it has been gradual and of a substantial nature. The new houses are the best houses. [N]or [h]as Marion matured; good houses are going up now, and more will follow. The splendid business sites, the cheapness of the lots, and the low price of building material makes this a good time for building a home at Marion. Building lots of all sizes can be found on all sides of the town. Those preferring suburban homes can buy from one to three acres or more on the outskirts of the town, and beyond the corporate limits. Marion is spreading out, and lots bought now are certain to advance in price as the town grows. Town tax this year is only 25 cents on the hundred, at the same time substantial pavements are driving out the old plank walks. Sewerage piping is taking the place of gullies and ditches and the streets are getting in better shape than ever before. One of the proprietors of the Marion Roller Mills, was born near Metropolis, Ills., in 1850. Four years later he came to this county and was raised on a farm. After reaching his maturity he engaged in the merchandise business for some time, but went back to the farm until 1890, when he purchased an interest in the Merchants Mills of this place and was made its manager. His methods are live and progressive; in his policy he is liberal, enterprising and honorable, commanding the respect of the community and inspiring a degree of confidence that few men are fortunate enough to acquire. He owns a fine residence in the city built only a year ago at a cost of $1,000. He is also engaged in the lumber business and handles all kinds of dressed lumber, sash, doors, blinds, all the fine finishing lumber, and furnishes such stock at the most reasonable prices. He makes a specialty of filling large orders, and can figure on a bill in a way that makes a good profit to the purchaser. Lumber is an article that farmers, merchants and business men must have, and a good quality is sought, such as is kept by Mr. Clark at his well established lumber yard. No man has figured more conspicuously in Crittenden county matters than R. W. Wilson and no man is held in higher esteem by the people of the county. He is a native of the county, was born December 29, 1829. He is a son of the late James Wilson who was one of the sturdy pioneers of the county. He was a farmer and business man, and at one time was a member of the legislature. R. W. Wilson was educated at Cumberland College. Until 1865 he was engaged in mercantile business with Mr. A. Armstrong at Marion. Afterwards he turned his attention to farming and trading at which he was successful. In 1867 he was elected county clerk and in 1870 he represented the county in the legislature. He was the chief spirit in organizing the Marion Bank and was made its president, which position he held until his health began to fail. Mr. Wilson has been very successful in accumulating wealth, and is one of the most generous of men. No public enterprises come up that he does not take the lead and his money is liberally spent in this direction. He has been and is as thoroughly identified with the county and town as any man who ever lived in either. Full of the milk of human kindness, charitable almost to a fault, no needy ever turned away from him empty handed or disheartened. Many are the people who have been helped by him in a financial way. The people have trusted him as an officer and confided in him as a friend, the courts have delegated to him special commissions, the church has depended on him for succor, and under all circumstances he has never failed to meet the demands. He owns handsome property in the county and among his possessions is the famous watering place, Crittenden Springs, which of late years has been improved and made one of the prettiest, and most desirable summer resorts in Kentucky. Everybody in Crittenden county will recognize at a glance the picture that accompanies this sketch, and not a few can call to mind some favor, some act of kindness the man whose profile it is has done them. J. P. Pierce was born in Jefferson county, Tenn., December 16, 1841. In 1858 he landed at Dycusburg, with all his possessions in a small trunk, and an invoice of this effect would have shown no cash, and nothing that would have brought cash sufficient to pay for three months board. He soon secured a school and taught several years. In August 1863 he enlisted in the confederate army and served until near the close of the war. He went to Illinois and farmed for a year, and then returned and permanently located on a farm in Crittenden. 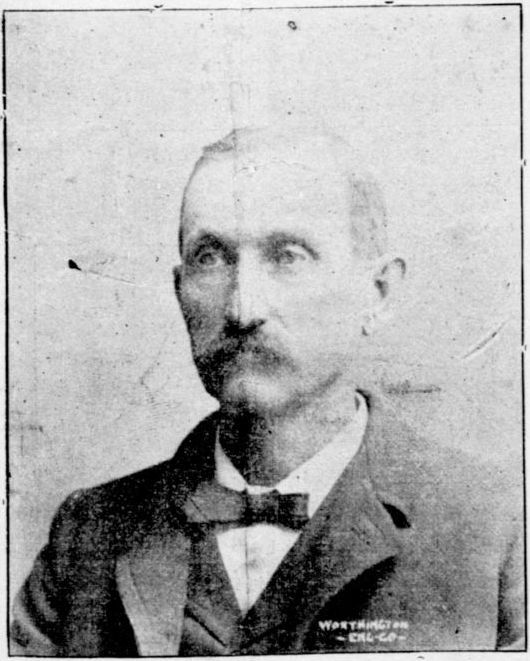 In 1874 he was chosen magistrate in Dycusburg precinct, and in 1878 he was elected sheriff and in 1880 he was re-elected by an increased majority. In 1882 he was elected county judge and served four years. At present he is engaged in merchandising, being the senior member of the hardware firm of Pierce & Son., and of the dry goods house of Pierce-Yandell-Gugenheim Co. Besides his interests in these two of the largest houses in the county, he is farming to some extent, and speculating in timber. Judge Pierce is a man of fine common sense, good education, varied information. He is well posted on all of the questions of the day, well served in financial affairs, thoroughly conversant in business matters. He is well qualified for most any position or work. He is a good citizen, and justly a popular man with the people. He has figured prominently in all the enterprises of the county; doing a large share of the work towards pushing the town and county to the front. Is doing a banking business that numbers it among the best institutions in the state of Kentucky. Its finances were so solid and well managed that it has felt but little the financial stringency that has shaken so many seemingly well-founded business houses. We are proud to state that the bank has tided over so great a struggle, unshattered, solid as the adamantine rock and with the full confidence of the people. The bank has an authorized capital of $200,000 with a surplus of $16,000. The officers are, as shown herewith: J. W. Blue, Jr., President; A. J. Pickens, Vice-President; H. H. Loving, Cashier; T. J. Yandell, Assistant Cashier, with the associate directors, J. W. Blue, Sr., H. A. Haynes and Sam Gugenheim, all men of conspicuous business and social prominence. None of our citizens are more widely and better known than these, and their business dealings have ever been based on the principles of honesty and integrity. The bank does a general banking business, issues domestic and foreign exchange, receives deposits, and attends to all forms of collections. Its correspondents are among the moneyed institutions of the country such as can not fail to give every bank connected in any business way with them a good prestige. Its management is at once conservative and judicious, extending to patrons every favor consistent with safe banking, such as will protect the depositor and aid the borrower. There is certainly no feature that more fully indicates the business and commercial importance of a town or city, than its banking institution. The bank, to a certain extent, is the great artery or channel that supplies the life current to all business enterprises and ore to animal vitality and existence. When such an institution has such progressive, wide-awake citizens at the helm as form this bank's official management, the influence is doubly felt, for no endeavor to aid the town is balked by them or culminates without their valued assistance. 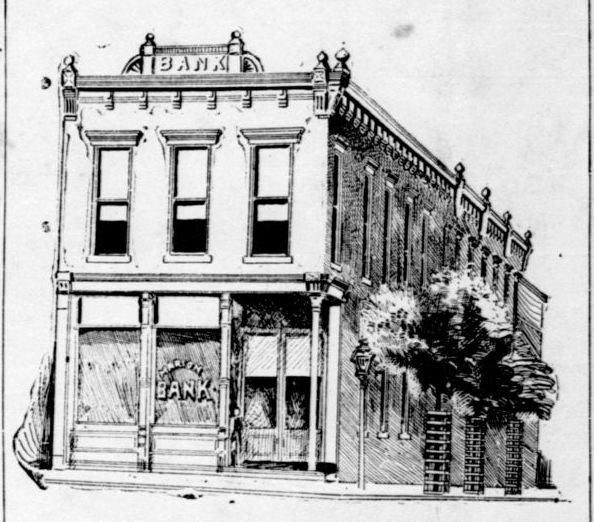 This bank not only forms a leading feature in the monetary interest of Marion and Crittenden county, but also in the adjoining and tributary counties. The bank has a fine building which is specially fitted with a fire proof vault in which reposes an all-steel safe, held shut by an automatic time lock, rendering it utterly impregnable against the encroachment of fire or theft. No extended notice of this institution could give one so smart an idea of the bank as the business it enjoys. It extends to its patrons both money and accommodations and has an individual responsibility, many times the amount incorporated for. The bank is worthy of an unlimited public confidence and hearty patronage both of which are enjoyed to the fullest extent. One of the oldest country stores in [t]he county is Moore's store: [a fe]w years ago the name was changed to Stone and a post-office established, and then to Mattoon, the present name. It is about one mile from the O. V. road, and at that place one of the most successful young business men of the county owns and operates a vast volume of business. E. C. Moore has built up the business founded by his father, R. L. Moore, years ago, until doubtless there is no firm in the county enjoying a more liberal patronage and a more satisfactory trade. He handles a stock of general merchandise, and that includes everything needed in a prosperous farming community. Dry goods of great variety, notions of all kinds, hats of all grades and styles, boots, shoes, and clothing; a big stock of groceries, fancy and staple, hardware and implements. He sold last year more harvesting machines than any other firm in the county. He occupies t[w]o large business houses, one 80x22, recently built, the other 50x22. Both of these houses are full of goods; his stock will average $10,000. He also handles tobacco on a pretty large scale, buying and prising [pricing] for the marke[t]s. In addition to this, he owns and runs one of the largest and best farms in the county, growing wheat and corn and raising hogs and cattle. Mr. Moore began business at that point ten years ago; by fair dealings and competing with the prices of the towns, and handling a big stock and great variety, he has made Mattoon the headquarters for a vast scope of country. He is a brother of Dr. R. L. Moore of this place, was born on a farm where he now resides December 22, 1862. He had a good business training under his father, was educated in the schools of the county; and these advantages together with his fund of good common sense, have rapidly brought to the form in commercial circles. While attending to his vast business Mr. Moore finds time to take an active interest in politics. He is an ardent Democrat, and his influence is felt in his precinct. The turnpike from this city to Salem is in splendid condition. The new coal mine in the suburbs of East Marion is yielding a fine article; it is good coking coal. In the old part of the city some sidewalks are badly needed. The records show that the trustees ordered these sidewalks built in the summer of 1894. The Street Railway Co., is now running cars to Crittenden Springs every half hour. The four big hotels at that popular summer suburban resort are crowded. The gas from the sulphur spring is now utilized in lighting up the place. The service now on the Princeton, Marion and Ohio River railroad is splendid. Four passenger trains each way daily. The company is also doing a heavy freight business. Ton after ton of our splendid spar is being shipped every week to the eastern cities. There is still some talk of the extension of the corporate limits of Marion. This talk originated back in the 90's, when the town tax was from 25 to 50 cents on the $100. The objection then was the town tax, and now the city tax is from 5 to 10 cents, the same objection is offered. There was an attempted strike of the 500 hands at the Pottery Works late yesterday afternoon. The trouble was purely sympathetic, but the local board of arbitration arranged matters to the satisfaction of all parties before the entire force of workmen in the establishment knew there was any trouble. Tolu is a remarkable little city in one respect. Not a drop of liquor was ever sold there. When the town was founded about fifty years ago, the lots were sold with the provision that no liquor should be sold on them; and notwithstanding the city limits have been greatly enlarged since then, the later purchasers have sacredly observed the original compact. The coking ovens at the Barnaby mines will be ready for operation by the first of the month. For years the coal at these mines has been recognized as the best in Southern Kentucky. This mine gets its name from an old Englishman, who sometime in the decide [decade] beginning with 1880 was attracted by the superior grade of coal, and began working it. It then had a wide local reputation, being sought after by the blacksmiths for miles. "Kit and Jack's["] coal, as it was called, was hauled on road wagons to Marion, when this place was a village some forty years ago. The old brick graded school house, which was sold to the colored school district yesterday, was built in 1894, and from an old copy of the PRESS found under a corner stone we learn that its building was a great event in the town then; and the fight to vote $8,000 to build it was long and lively. Really our forefathers of 1894 must have been pretty close-fisted fellows. If they were to see our public school buildings scattered over the city now, or gaze on the magnificent proportions of either of our two handsome college buildings in the lovely suburbs three miles from the court house, they would be astonished. The five story building on Bellville street, at the corner of Maxwell avenue, occupied by the Yandell Dry Goods Co., was struck by lightning last evening. The once subtle fluid was promptly caged in the huge reservoir and will be served to the clerks at a ten o'clock lunch this morning, as a stimulant while the thunderbolt is being put up in small packages, and will be given to the boys for the 4th of July celebration. By the way, this is one of the most enterprising firms in town. In looking over some old files of the PRESS we discovered that Mr. Yandell, the senior member of the firm, is a son of the late Wm. Yandell, who was one of the original founders of the business under the corporate name of Pierce-Yandell-Gugenheim Co. 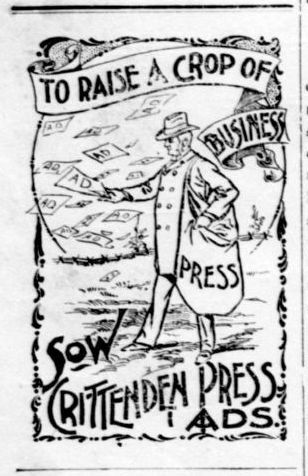 Source: Crittenden Press. (Marion, Ky.) 1879-1907, August 16, 1894, Image 2 - Chronicling America - The Library of Congress.